Citing Abortions In China, Trump Cuts Funding For U.N. Family Planning Agency : Goats and Soda The administration claims the U.N. population agency supports China's "coercive" abortion policies. UNFPA calls the claim "erroneous." 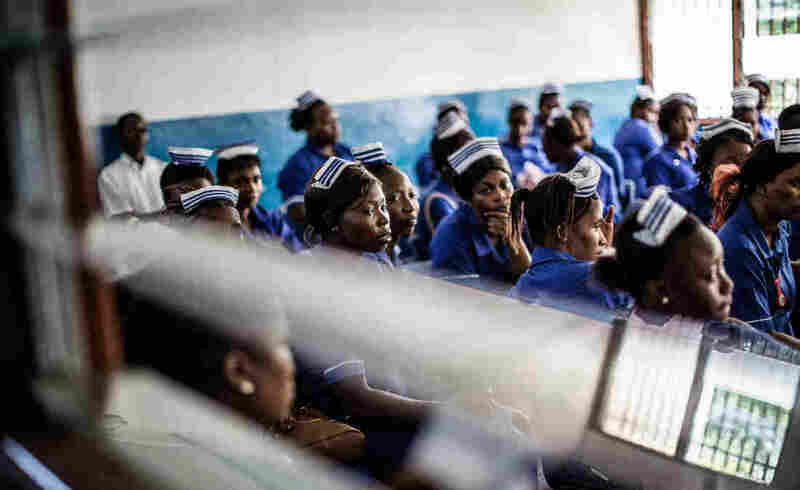 Students at a school for midwives wait in a classroom in Sierra Leone. UNFPA supports the local ministry of health with a program that promotes maternal health and family planning. The Trump administration will withhold $32.5 million in funding that had been earmarked this current fiscal year for the United Nations' lead agency on family planning and maternal health, known as the United Nations Population Fund or UNFPA. The administration says it's doing so because it has determined that UNFPA helps to support a Chinese government family planning program that forces people to get abortions and sterilizations. The U.N. agency says that is not the case. Though the administration's decision was widely expected, it was greeted with dismay by supporters of reproductive health programs, whose objections start with the Trump administration's memorandum of justification. The memorandum stated that "there is no evidence that UNFPA directly engages in coercive abortions or involuntary sterilizations in China" but asserted that that the agency "continues to partner with [China's national family planning agency] on family planning, and thus can be found to support, or participate in the management of China's coercive policies." In a statement, UNFPA countered that the claim was "erroneous," asserting that "all of its work promotes the human rights of individuals and couples to make their own decisions, free of coercion or discrimination." The statement added that U.N. member states "have long described UNFPA's work in China as a force for good." At a press conference, U.N. spokesman Stephane Dujarric predicted the funding loss "could have devastating effects on the health of vulnerable women and girls and their families around the world." The ramifications would mainly be felt in countries other than China since UNFPA's spending there has actually dwindled to minimal levels in recent years. The U.S. funding accounts for about 7 percent of UNFPA's worldwide budget, according to agency officials. They said the U.S. contribution in 2016 enabled UNFPA to save 2,340 women worldwide from dying during pregnancy and childbirth, prevent 947,000 unintended pregnancies, prevent 295,000 unsafe abortions and fund 1,251 surgeries for fistula, a devastating condition resulting from obstructed labor that causes a woman's urine or feces to leak out of her body. Supporters of reproductive health programs are all the more disheartened because the de-funding decision comes on the heels of the administration's re-imposition through executive action of a separate policy that bars U.S. funding of international family planning groups that provide or "promote" abortions — defined to include health workers offering women referrals or basic information about the procedure. That "Mexico City policy" — named for the city where then-President Ronald Reagan first unveiled it — did not apply to UNFPA because the agency is a "public international organization" rather than a non-governmental group. Instead, the Trump administration is withdrawing UNFPA funding by invoking the "Kemp-Kasten Amendment." This provision, included by Congress in every foreign operations spending act since 1985, prohibits U.S. funding of any organization or program that the president determines "supports or participates in the management of a program of coercive abortion or involuntary sterilization." The amendment was adopted in response to China's introduction several years earlier of its "one-child policy" to control population growth. At the time there were rampant reports of Chinese officials forcing women to have abortions. In October 2015 China officially ended the one-child policy. But it still sets limits on births per individual. The most recent human rights review by the U.S. State Department, released last month, found that this "in some cases resulted in forced abortions (sometimes at advanced stages of pregnancy)." Craig Lasher, a senior fellow at the abortion rights advocacy group PAI, does not dispute such charges. But, he says, "if you're concerned about human rights abuses in family planning programs it's better to constructively engage than to walk away. And UNFPA has been part of the solution — not the problem." For instance, he notes, over the years the agency has limited its operations in China to localities where the government agreed to UNFPA's pre-conditions that it eliminate birth targets and quotas. And he says, "UNFPA has tried to work with the Chinese on a more integrated, client-centered health approach which included education and counseling regarding informed choice and reproductive rights." Still, he notes, legally the Kemp-Kasten Amendment gives a president a lot of latitude. "What does 'support or participate in the management of a [coercive] program' mean? The language is so broad that you can interpret it to justify any decision you want to make." And because of that latitude, a pattern has emerged over the past three decades that's mirrored the Mexico City policy: Each time a Democratic president has followed a Republican — first Bill Clinton, then Barack Obama – he has restored UNFPA's funding. Each time a Republican has come back into office he's de-funded it again, starting with George W. Bush, and now Donald Trump. Even during the periods when a president has permitted funding of UNFPA, Congress has nonetheless imposed strict limits, notes Lasher. For instance, Congress has regularly required that the U.S. determine how much UNFPA spent in China and then reduce the overall U.S. contribution to the agency by that dollar amount. As required by the Kemp-Kasten Amendment, the money that has now been withdrawn from UNFPA will go back to the pool of aid money that Congress had appropriated to support family planning and maternal health overseas this fiscal year. But details remain unclear because much of that pool — about $607.5 million annually — has been going to groups that will be blocked from U.S. funding under the Mexico City policy. Trump's order reinstating the Mexico City policy was also more expansive than past versions. The administration is applying it not just to family planning aid disbursed by USAID but to all spending on global health government-wide. The administration is expected to issue more information on which programs will be affected in the coming weeks. Meanwhile, at the press conference, U.N. spokesman Stephane Dujarric said the Secretary General António Guterres is appealing "to donors to increase their support for UNFPA to allow it to continue its critical work during this difficult period."